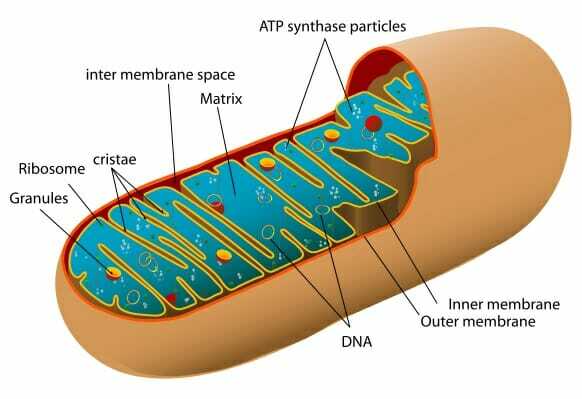 Mitochondria (singular: mitochondrion) are organelles within eukaryotic cells that produce adenosine triphosphate (ATP), the main energy molecule used by the cell. For this reason, the mitochondrion is sometimes referred to as “the powerhouse of the cell”. Mitochondria are found in all eukaryotes, which are all living things that are not bacteria or archaea. It is thought that mitochondria arose from once free-living bacteria that were incorporated into cells. Mitochondria produce ATP through process of cellular respiration—specifically, aerobic respiration, which requires oxygen. The citric acid cycle, or Krebs cycle, takes place in the mitochondria. This cycle involves the oxidation of pyruvate, which comes from glucose, to form the molecule acetyl-CoA. Acetyl-CoA is in turn oxidized and ATP is produced. The citric acid cycle reduces nicotinamide adenine dinucleotide (NAD+) to NADH. NADH is then used in the process of oxidative phosphorylation, which also takes place in the mitochondria. Electrons from NADH travel through protein complexes that are embedded in the inner membrane of the mitochondria. This set of proteins is called an electron transport chain. Energy from the electron transport chain is then used to transport proteins back across the membrane, which power ATP synthase to form ATP. The amount of mitochondria in a cell depends on how much energy that cell needs to produce. Muscle cells, for example, have many mitochondria because they need to produce energy to move the body. Red blood cells, which carry oxygen to other cells, have none; they do not need to produce energy. Mitochondria are analogous to a furnace or a powerhouse in the cell because, like furnaces and powerhouses, mitochondria produce energy from basic components (in this case, molecules that have been broken down so that they can be used). Mitochondria have many other functions as well. They can store calcium, which maintains homeostasis of calcium levels in the cell. They also regulate the cell’s metabolism and have roles in apoptosis (controlled cell death), cell signaling, and thermogenesis (heat production). Mitochondria have two membranes, an outer membrane and an inner membrane. These membranes are made of phospholipid layers, just like the cell’s outer membrane. The outer membrane covers the surface of the mitochondrion, while the inner membrane is located within and has many folds called cristae. The folds increase surface area of the membrane, which is important because the inner membrane holds the proteins involved in the electron transport chain. It is also where many other chemical reactions take place to carry out the mitochondria’s many functions. An increased surface area creates more space for more reactions to occur, and increases the mitochondria’s output. The space between the outer and inner membranes is called the intermembrane space, and the space inside the inner membrane is called the matrix. This diagram shows the structure of a mitochondrion. Mitochondria are thought to have evolved from free-living bacteria that developed into a symbiotic relationship with a prokaryotic cell, providing it energy in return for a safe place to live. It eventually became an organelle, a specialized structure within the cell, the presence of which are used to distinguish eukaryotic cells from prokaryotic cells. This occurred over a long process of millions of years, and now the mitochondria inside the cell cannot live separately from it. The idea that mitochondria evolved this way is called endosymbiotic theory. Endosymbiotic theory has multiple forms of evidence. For example, mitochondria have their own DNA that is separate from the DNA in the cell’s nucleus. It is called mitochondrial DNA or mtDNA, and it is only passed down through females because sperm do not have mitochondria. You received your mtDNA from your mother, and you can only pass it on if you are a female who has a child. It is also circular, like bacterial DNA. Another form of evidence is the way new mitochondria are created in the cell. New mitochondria only arise from binary fission, or splitting, which is the same way that bacteria asexually reproduce. If all of the mitochondria are removed from a cell, it can’t make new ones because there are no existing mitochondria there to split. Also, the genome of mitochondria and Rickettsia bacteria (bacteria that can cause spotted fever and typhus) have been compared, and the sequence is so similar that it suggests that mitochondria are closely related to Rickettsia. Chloroplasts, the organelles in plants where photosynthesis occurs, are also thought to have evolved from endosymbiotic bacteria for similar reasons: they have separate, circular DNA, a double membrane structure, and split through binary fission. Adenosine triphosphate – The main energy molecule used to power cellular activities; it is produced by mitochondria. Endosymbiotic theory – The idea that mitochondria and chloroplasts (in plants) evolved from bacteria that was once free-living being incorporated into the cell. Electron transport chain – A step in oxidative phosphorylation and the production of ATP where electrons travel through a series of protein complexes. Citric acid cycle – A series of chemical reactions in the matrix of the mitochondria that releases energy through the oxidation of acetyl-CoA. 1. Which is a function of mitochondria? D is correct. All of the above are functions of mitochondria. Mitochondria also have roles in apoptosis, cell signaling, and thermogenesis. 2. Which is NOT a reason why mitochondria are thought to have evolved from free-living bacteria? A. Mitochondria have their own DNA. B. Mitochondria reproduce through binary fission. C. Mitochondrial DNA is inherited matrilineally. D. The genome is similar to that of bacterial DNA. C is correct. While it is true that mtDNA is inherited from the mother, it is not a reason why mitochondria are thought to have evolved from bacteria that had an endosymbiotic relationship with cells. It is inherited this way because sperm do not contain mitochondria. Choices A, B, and D suggest that mitochondria have similarities to, and evolved from, bacteria. 3. Where is the mitochondrial matrix located? A is correct. The matrix is a space enclosed by the mitochondrion’s inner membrane. Choices B and D both refer to the intermembrane space, which is the space between the two membranes.